Dear, dear readers...I must apologize. I've been holding out on you. You see, there is a recipe that I came up with by happenstance a couple of years ago and I've been making it regularly ever since (and you know it's good, because me actually making something on a regular basis is in itself an irregularity). This recipe is ridiculous. Almost as ridiculous as salt and pepper pasta. This is a recipe that is so stupidly easy and simple, so fast to throw together, can make totally varied quantities depending on your needs and is basically just perfect for a working/busy family. It's not the prettiest thing I've ever made, but if you pair it with a salad, you have a healthy, balanced meal that will totally blow your mind. If, of course, you like Indian food. If you hate curry, well, read no further...this is yummy, but not likely to convert an avowed curry hater. Everyone else will love it though, and you can pat yourself on the back, because it's just so stupidly easy that you won't mind making it over and over again. In this particular instance, I was making a triple batch, but I'm going to give you the quantities for a single batch instead...though the leftovers are so yummy, you may want to double or triple it. 1. 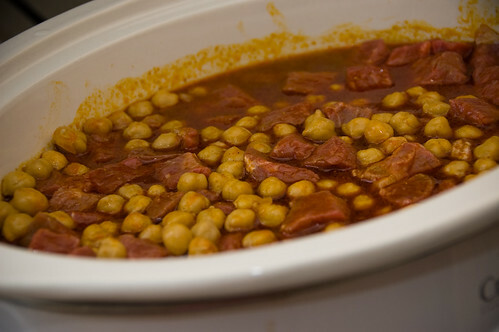 In the morning, throw the beef, chickpeas, broth and curry paste in the crockpot (these proportions are best-suited to a 2-3 qt crockpot...my triple batch was perfect in a 6 qt pot). Turn the crockpot to low and go about your life for the rest of the day. I've even put the beef in frozen and it still tastes good. You want the liquid to not cover your ingredients, but ALMOST to cover them, so add a little more if you're short. BTW, life is easiest if you combine the broth with the curry paste, and THEN add the beef/chickpeas. 2. When you get home (or about 20 minutes before dinner), throw the whole curry into a large skillet and turn the stove to medium-high. Add the peas (use frozen peas, don't bother thawing). You want to get the liquid to evaporate to make an almost-dry curry. You could simply drain it off, but having it evaporate concentrates the flavours a lot more. It's much tastier. 3. Meanwhile, combine the yogourt, garlic, cilantro and lime in a small bowl. If it's not a saucey consistency, add a little milk to thin it out. Heat up your naan/pita in the oven at 350F for about 5 minutes (wrap them in foil). 4. 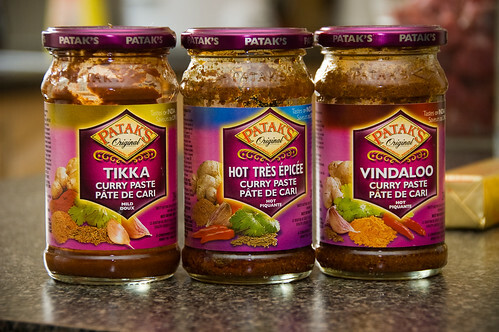 By the time you've finished the sauce, your curry is probably close to ready. Turn off the heat and stir in the cilantro. 5. To serve, you can try to eat it like a wrap (which is delicious, but generally messy), or make a curry 'pizza' on your plate and drizzle with sauce. Maybe not the prettiest thing ever, but it's SO GOOD. I absolutely love making this. You could make it vegetarian/vegan by omitting the beef/broth (duh) and either adding more chickpeas, or some paneer (though not for the crockpotting portion of the day), or some spinach. 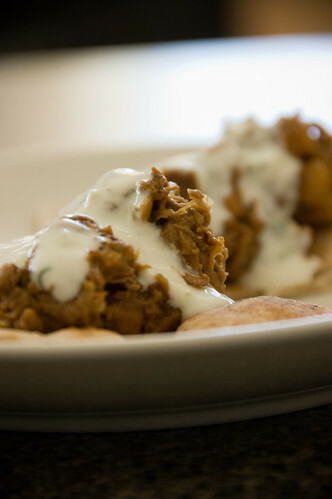 The recipe is just a guide, but anyone with a crockpot should make this. Even if you don't have a crockpot, it would fare very well in a cast iron (or other) dutch oven in the oven for a few hours. 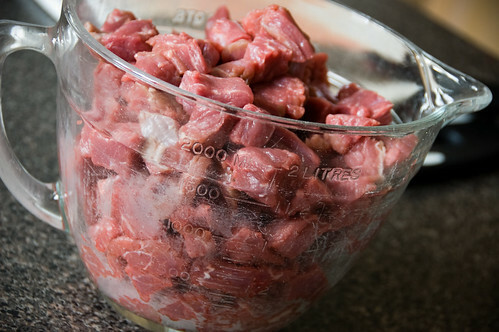 The key is cheap, non-fatty beef and a long cooking time to soften it up. If you make this, you will like it, guaranteed. Hubs has been after me for weeks to post this recipe, so I hope you enjoy! Also, the reason there are no peas in this particular iteration is that it was hubs' job to add them and he neglected to do so. It's good with or without peas, but it's always good to add more veggies. This looks great! Curry is such a wonderful dish, it can be as complicated or as simple as you like. I'm always looking for something different. Thanks! I've made this plenty of times! it took a bit of fiddling with the amount of broth though - the first few times I followed the recipe, but it was almost never enough and I got burnt tips of beef. So now I just add until it's *almost* covered (like you said!) and it turns out amazing! yum! Too bad hubs doesn't like it as much as I do.. he's not a big fan of chickpeas or cilantro. I've been trying to change it up so he'll like it more. What do you do with the leftovers, can you freeze it? this looks so good, i'll have to try it the regular way since i don't have a crock pot. 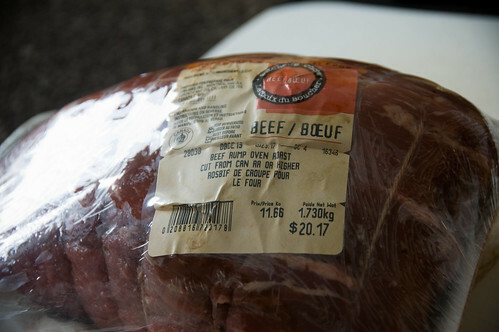 i also love the tip about cutting your own stewing beef. nice! Thanks for listening to your husband and posting. This sounds Delicious! YUM! 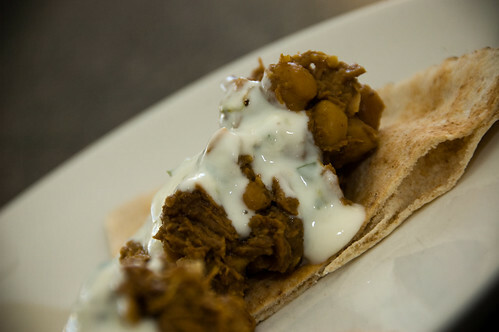 I love curry and chickpeas! This is already in my crockpot for dinner tomorrow. You had added the recipe to the H! cookbook years ago. I added an onion, two carrots and three celery stalks. We have left over jasmine rice to serve it with. Lesley, you can freeze this puppy, I have many times. I would put aside the portion to freeze with the liquid and do the pan part the day of re-heat. Just what we need to fight the cold and the colds! If you're avoiding dairy, what could you use to sub for the yogurt? I'm not usually a big fan of soy yogurt, (too many weird ingredients that try to make it taste like yogurt ...) but would soy milk work instead? Sounds wonderful. I am always looking for new crockpot meals. Hope I can find the curry paste. Looks tasty. I wonder if turkey could be used in place of beef (non-red meat eater). Ohmygosh, I cannot WAIT to make this! Thank you! Totally delicious and dead simple. Easiest and Best? Count me the most grateful and ravenous! Thanks for the crockpot recipe. Last winter I ate them at a party and has been looking for an authentic recipe ever since. Now I will be able to make them myself. Thanks again. I just tried this and it is deeelish! Thanks!! !